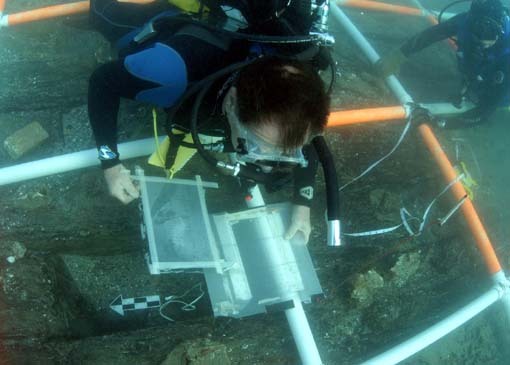 One of the major tasks of ADMAT's Underwater Survey Diver course, is to design a grid which will cover the maritime archaeological site enabling the frames to be measured in with accuracy. Clearly the whole wreck could not be completed in the time allocated so the decision was made to focus on the stern section which was the easiest to uncover. The criteria being that the grid should cover the stern section, missing the black sponge and designed to protect the coral along the keelson. Further criteria being that the grid must withstand major storms, as the field school was in a very active hurricane season. ADMAT’s normal grid is made of 1 metre square interlocking sections with nails securing the intersections. The all important cross pieces are kindly sponsored by NIBCO who manufacture them. However the design plan for the grid was discussed as a task for the students. They took the basic design and enhanced on it as part of ADMAT’s ~Underwater Survey Diver course. The students used diagonal nails to interlock the pieces together which were then bent over locking the grid together. The second enhancement was that along the centre line, the grid rose one meter high to form a protective tunnel for the keelson, the keel bolts and the coral growth. The design was a combination of Patrick Enlow (Green Beret and Special Forces engineer) and Dr. It Vladimir Pletser (European Space Agency). The grid was numbered alphanumeric with A0 on the port side; E0 down the keelson line. The grid number is always read from the upper left hand corner. In total the grid was extended for 10 meters in length (33 ft) and 7 meters (23 ft.) wide. Once the grid was constructed, the Team practiced constructing it in the back yard, which would make constructing it underwater easier. ADMAT’s Underwater Survey Diver course (Equivalent to NAS part 1 to 2) was given and the Team then practiced measuring items into the grid on land. Once the grid was finished, each piece was coded and it was disassembled. The plan being that underwater the coded grid would slot together without any problems. The next challenge was to take all the pieces on Capt. Bob’s boat to the site and erect it underwater. Guillaume and Jayne spray painting the "zig zags"